How: How does collective behavior emerge? 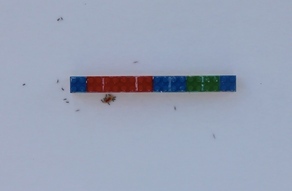 I study consensus decisions during cooperative transport in ants. Cooperative transport is prone to deadlocks – in uncoordinated species, individuals pull in opposite directions. 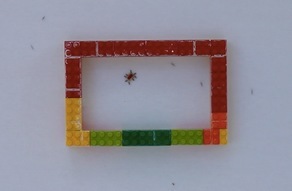 Efficient species – which can move objects many thousands of times their mass – overcome deadlocks rapidly. I use theoretical models and empirical studies to explore the individual-level traits and behaviors that allow group-level consensus. I use models to identify hypotheses for behavioral rules and other traits that should make for good transporters, and test those hypotheses empirically. Army ants in the Eciton genus have high traffic on their foraging and migration trails, and to optimize traffic flow, these ants construct bridges out of themselves. This allows the trail to more easily cross gaps in heterogeneous terrain. 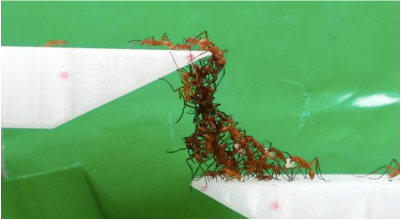 As part of a collaborative effort, I am currently exploring how army ants construct and deconstruct these bridges, and how the bridges adapt to changing gap size. Why: What are the benefits of collective solutions to problems? 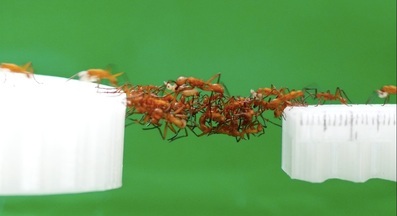 Ants working together to carry something must collectively navigate around obstacles. This requires making a series of decisions that build on one another, or problem-solving. 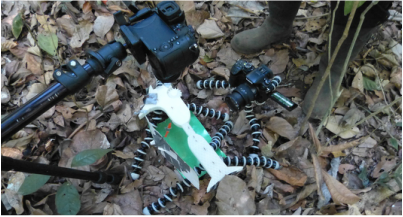 I look at how groups of Paratrechina longicornis ants solve these problems – what kind of strategy do they use for obstacle navigation? This work was featured in The New York Times and Inside JEB. I also explore the robustness and efficiency of this collective strategy, and I am exploring collective obstacle navigation in other animal groups. Where/When: How do group solutions deal with varying context? The ways that collectives solve problems and accomplish tasks seem to be particularly robust to changing conditions. Yet the challenges that these groups overcome differ substantially from place to place and time to time. How do groups deal with the trade-offs to succeed across varying context? 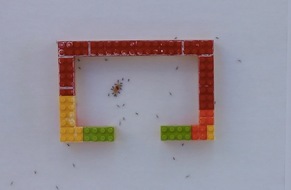 I use cooperative transport by crazy ants as a model to explore the mechanisms leading to robustness of group behavior. I look at high variation in the objects being carried (changing task requirements), as well as in the specific challenge the group is facing (external context).